If you're a fan of such cool shooters as Metro 2033 and Metro: Last Light, then today we have for you some good news about these two games. 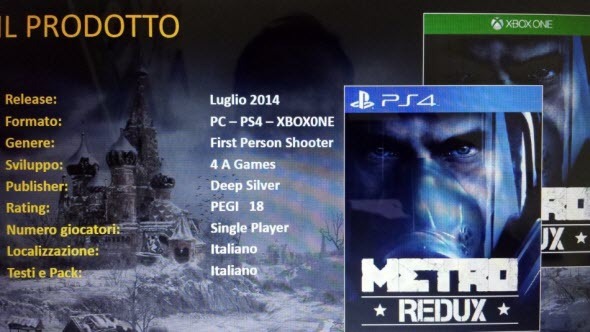 So, yesterday on the Italian Everyeye.it site an information about a collection, entitled Metro 2033 Redux, appeared. 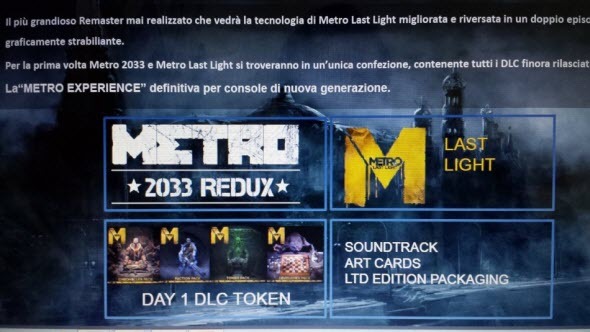 Judging by the images, published on the same site, this compilation will include two games in Metro series, all add-ons released previously, as well as projects’ soundtracks. In addition, on the second screenshot we can see the information about the platforms for which Metro 2033 Redux compilation is supposed to be launched - PC , PS4, Xbox One, - as well as its release date - July 2014. But that's not all. According to the text on the first image, both games in Metro 2033 Redux collection will get already significantly improved graphics, which has become possible due to their port for the next-gen consoles. At the moment, neither the developer of this reedition - 4A Games, - nor its publisher - Deep Siver - has commented on this information, but we hope that in the near future the situation will become clearer and we will be able to enjoy such an interesting collection. And what do you think about Metro 2033 Redux? Is it real or just someone’s speculations? Your answers can be left at the bottom of the page.